The LED light therapy treatment is a safe, effective use of advanced LED light technology designed to help diminish the visible appearance of fine lines, wrinkles and age spots by promoting collagen firmness. Designed by dermatologists as a cosmetic system for salons, spas, and physicians, the treatment keeps the skin conditioned by using photopulsation to exercise and firm up the skin’s collagen. Skin will naturally appear smoother, tighter, and more radiant. This is the works. The Deluxe Eminence Facial with an extended massage which includes the head and scalp, the Eminence Bright Eyes and Lip Treatments, and a LED treatment are also included. 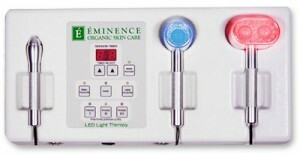 Red Light helps to encourage collagen production and healing in the skin. Helps to increase blood and oxygen flow to the skin and capillaries, therefore increasing cellular metabolism and strengthening the capillary walls. Éminence LED Light Therapy can help tighten the skin without any downtime, making this treatment ideal for anti-aging. Red LED Therapy is also an excellent treatment for scarring and rosacea. Blue light is the only light currently approved by the FDA for acne. Blue light destroys the bacteria on skin and prevents bacteria from forming.